An architectural monument designed by renowned architect Philip Johnson. The non-denominational church is open to the public and operated under the auspices of the Episcopal Diocese of Indianapolis. It was commissioned by the late Jane Blaffer Owen, founder of the Robert Lee Blaffer Foundation and a New Harmony resident passionate about preserving nature. The memorial garden was dedicated in 1982 to the memory of Carol Owen Coleman (1944-1979), daughter of Kenneth Dale and Jane Blaffer Owen. 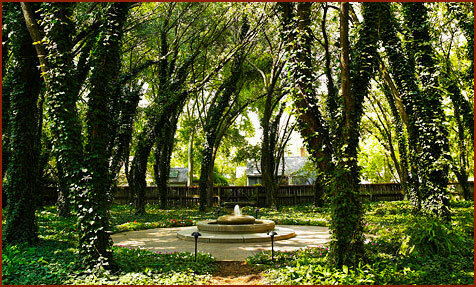 The Fountain of Life is located in the center of Carol’s Garden beneath a stunning canopy of Bradford pear trees. The peaceful fountain and its two accompanying benches were made with Indiana limestone by Sculptor David Rogers of Bloomington, Indiana. 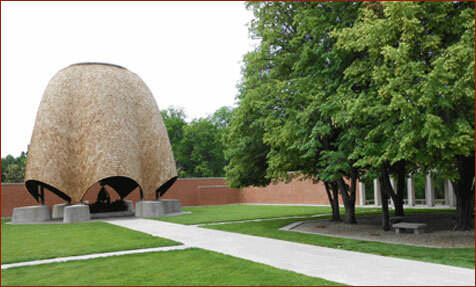 Robert Lee Blaffer Foundation has several properties that include sculptures in New Harmony, Indiana. Please call Chris Laughbaum at 1-812-682-3050 to acquire information on properties. Children, ages five through eight, test their creative skills at a Foundation sponsored Summer Art Camp. The students’ art is exhibited each year at the Hoosier Salon New Harmony Gallery during the months of July and August. The New Harmony Project encourages the creation, nurturing and promotion of new works for stage, television and film that sensitively and truthfully explore the positive aspects of life. An architectural monument designed by renowned architect Philip Johnson. The non-denominational church is open to the public and operated under the auspices of the Episcopal Diocese of Indianapolis. It was commissioned by the late Jane Blaffer Owen, founder of the Robert Lee Blaffer Foundation and a New Harmony resident passionate about preserving nature. Johnson and Owen envisioned a church where the only roof large enough to encompass a world of worshippers was the sky. The church was dedicated in 1960 and is maintained by the Episcopal Diocese of Indianapolis and Southern Indiana. Today, in addition to being a tourist attraction, the Roofless Church is a popular site for weddings and other sacred ceremonies. .
1-812-682-3050 or use our Contact Form. Jane Blaffer Owen CBE (1915-2010) was born in Houston, Texas, the daughter of Robert Lee Blaffer and Sarah Campbell Blaffer. Her father helped start the Humble Oil Company, now Exxon, and her maternal grandfather was a founder of the Texas Oil Company, formally known as Texaco. She grew up traveling the world, and in 1933, graduated from the Ethel Walker School in Connecticut. She studied at Bryn Mawr, the Washington School of Diplomacy, and the Union Theological Seminary in New York.